Thankful for my good health and my good state of mind. Thankful for all of my loved ones. Thankful for all of my family, close by or far away. Thankful for my beautiful daughter Vivian who is my greatest love. Thankful for Vivi's hugs, kisses and her "I love you more's". Thankful for Vivian's great health and God looking out for her. Thankful for a rich table full of great meals and great people around it. Thankful for a warm home filled with even warmer hearts. Thankful for a 10-minute drive to work. Thankful for fun co-workers who make me laugh and make the work day look shorter and less hectic. Thankful for cozy sweaters and pretty blouses (like I paired them today). Thankful for Fall florals (more of those today, too). Thankful for the mostly great weather we have had this Fall. You might remember this Vine-Print Burgundy Blouse from Loft when I wore it on Election Day. Today I paired it with another sweater: a Pretty Pink Marled V-Neck from Old Navy. I also did a little pattern-mixing with my Navy+White Floral Cropped Pixie Pants also from Old Navy. Outfits like these (a sweater with a blouse underneath paired with pants) look great with a Crossbody Bag so just like the navy one last time, I matched my Burgundy Blouse with my Burgundy/Plum Crossbody Bag. And since I wore this to work, I paired it all with my Light Pink Suede Sam+Libby Loafers. I showed you an outfit last week of how to dress up a sweater for work with a blouse. Today is another, different version of this outfit which is a polished but casual work look. I will be wearing a version of this outfit tomorrow for Thanksgiving Dinner to. What about you? What will you be wearing?! 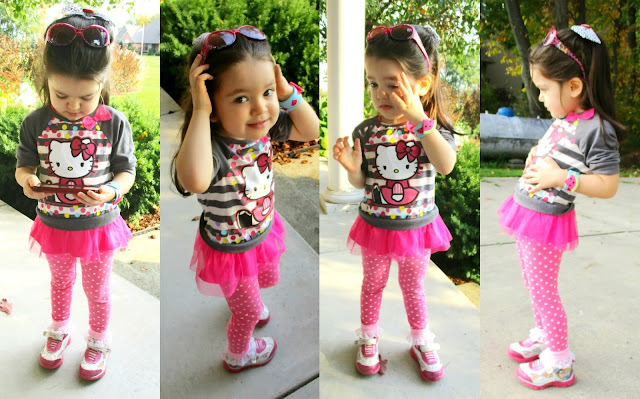 5 words for Spunky Vivian's Outfit: Frills, Bows, Pink, Stripes and Dots. Bright Pink Marled V-Neck, Long-Sleeve Cotton Sweater: Old Navy (New) (identical), (similar, Great Deal, love this), (similar cashmere option, on Sale, my Favorite). Burgundy, Convertible-Sleeve "Midnight Vine" Utility Blouse: Loft (New) (identical), (similar current option from Loft, on Sale), (similar w/ bow-tie, Great Deal, love this), (similar, Huge Splurge). Navy/White/Olive Lily Print Floral "Pixie" Pants: Old Navy (similar current option from Old Navy, Huge Steal, want these too! ), (similar, on Huge Sale, love these), (similar, on Sale), (similar, Splurge, my Favorite). Dainty Oval-Shaped "Elisa" Necklace in Rose Gold Druzy: Kendra Scott via Rocksbox (New) (identical, Splurge), (similar, Huge Steal), (similar, love this). Black Leaf Crystal Cluster Earrings: Wal Mart (New) (similar, Steal, love these), (similar flower studs, Steal), (similar, Small Splurge). Gray 3/4 Sleeve Graphic "Hello Kitty" Sweatshirt w/ White Stripes & Pink Tulle Peplum Hem: Disney. Hot Pink w/ White Polka Dot Minnie Mousse Leggings: Carter's. White Big Bow Barrette w/ Hello Kitty Print & Hello Kitty Head in the middle: Target (New). Hot Pink Disney Princesses Sunglasses: Disney. Turquoise w/ Pink Watermelon, Jelly Bracelet: Target (New). Light Pink w/ White Lace Trim Socks: Target. White+Pink Sparkly "Disney Princesses" Sneakers: Disney. And back in October (below), I wore these same Navy Floral Pants on a Mommy+Daughter Date with Vivi. 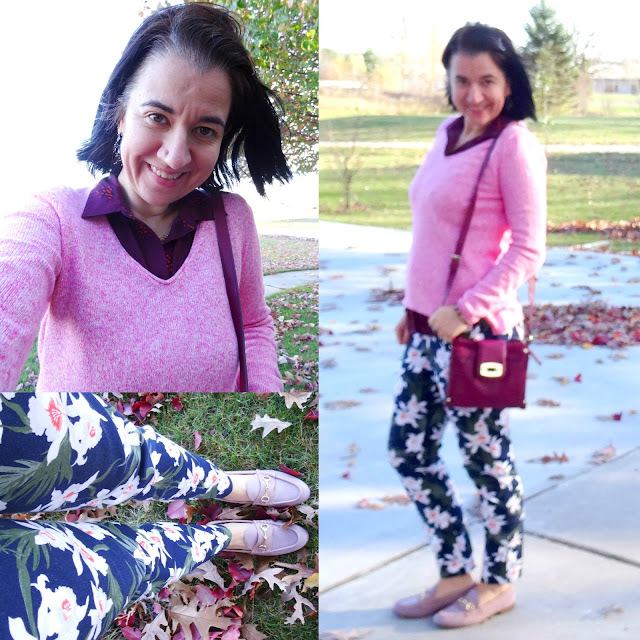 I layered them differently, with a Teal Tunic Blouse and my Lavender Suede Loafers instead, but I did keep the same Pink Loafers and Burgundy Crossbody as the outfit above. Teal 2-in-1 Marled+Silky Tunic Blouse w/ Reversible Sleeves: The Limited (New) (similar, on Sale), (similar w/ teal flowers, Steal, love this), (similar babydoll style, Great Deal), (similar patterned option, Splurge, my Favorite). Lavender Suede, Long-Sleeve Jacket w/ Silver Snap Buttons: Express (Old) (quite similar, comes in many colors, Splurge, my Favorite (similar in denim lavender, on Sale), (similar in tan, Steal), (similar in rose quartz, my Favorite), (similar in peach, Small Splurge). 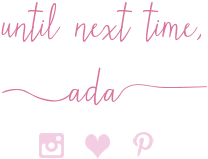 Since it is Thanksgiving and I am thankful for each and every one of you that links up every week, stops by, comments, compliments an outfit, follows me or simply browses, I am featuring a dozen favorite looks this week. 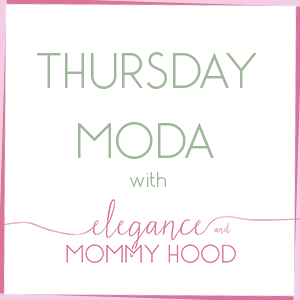 Part one of my favorites that linked up last week, is today - it is all about Casual Outfits and part two will be tomorrow about Dressy Outfits. I mentioned above, that first outfit would be something very similar to what I will personally wear tomorrow for Thanksgiving. I think for a cozy, casual dinner at home like I will be having, it is the perfect outfit. Last week I found several Casual Outfits which I thought would be great to wear for a casual Thanksgiving Dinner or if you are the hostess. Just like my outfit today, layers are important for many different reasons: keeping warm, being comfortable, hiding a food belly, etc. 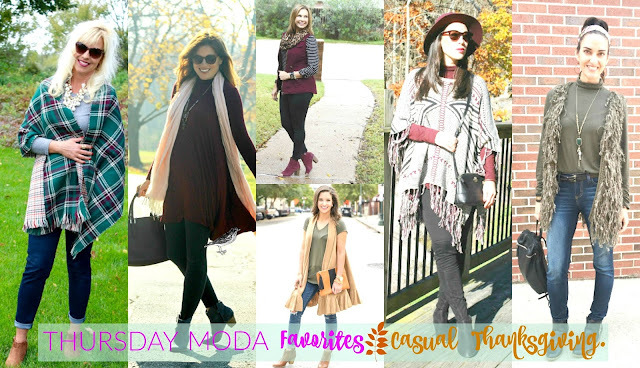 These outfits I am featuring which I loved from last week, may be casual but still very put together and quite festive between all the plaid, cranberry and Merlot colors. And ladies, booties are the perfect shoes to wear with these outfits, for a Casual Thanksgiving. Andrea nailed a 'Blanket Scarf Re-Create' with her Emerald Tartan and Houndstooth Reversible Scarf. Loved that cluster pearl necklace with this. She is due with her fifth baby any day, but Rose is stunning in her Bourdeaux 'Swing Dress' styled for the cold weather. Shelly is 'Vest Obsessed' and so am I this season. I need one in burgundy like hers and the fun matching booties too. Also, burgundy goes great with B+W stripes and leopard. Kim's 'Ruffle Vest' is beautiful and trendy. Love the gorgeous camel shade and I love that she matched it with accessories in the same color. It is 'Poncho Weather', I agree with Tamara. And since hers has Neutral Colors it practically goes with everything. 'Olive Green & Comfy Jeans' for Chrissy. While I love that shaggy vest, it is her headband and backpack, the fun accessories that stand out in her outfit. 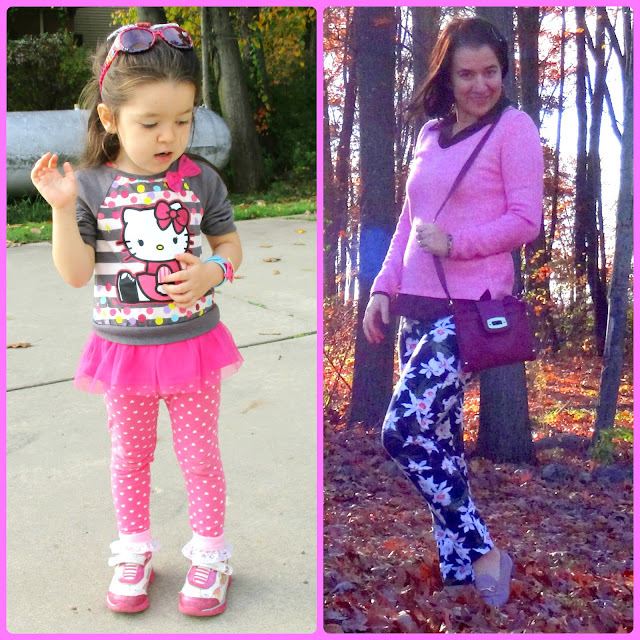 Also linking with Ana Luiza and Michelle for their "Start Off Stylish" Linkup. And, lastly, linking with the ladies of "The Blended Blog".